DIY iPad stylus and app test. Just bought an iPad recently and I have been trying out some different drawings apps. I can’t really draw with my finger so I made myself a stylus. The nib is made of conductive foam which is like a sponge that carries the electric current from your finger to the pad. It is used in electronics and not hard to find. I shoved the foam nib into a metal pen that I took apart. Now I have a stylus that works just fine. The app that I found to be the best was ProCreate. I honestly feel that I can do some real work with it.… KEEP READING! 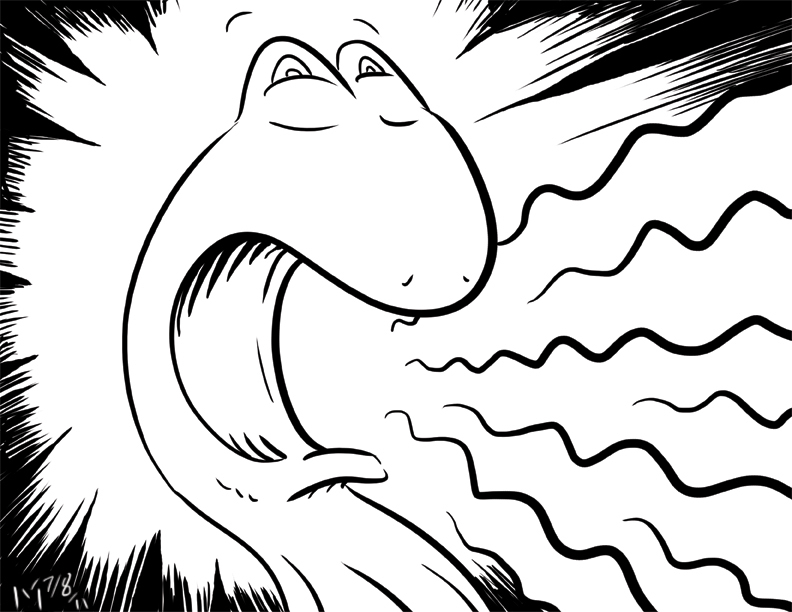 This is the first panel of the first page of the first issue of Henchmen, a project I’ve posted about before. I’ve finally moved into the inking stage. It will be interesting to see what the last panel on the tenth and final issue will be. Of course I know that already, but you know what I mean. More as it develops.… KEEP READING! 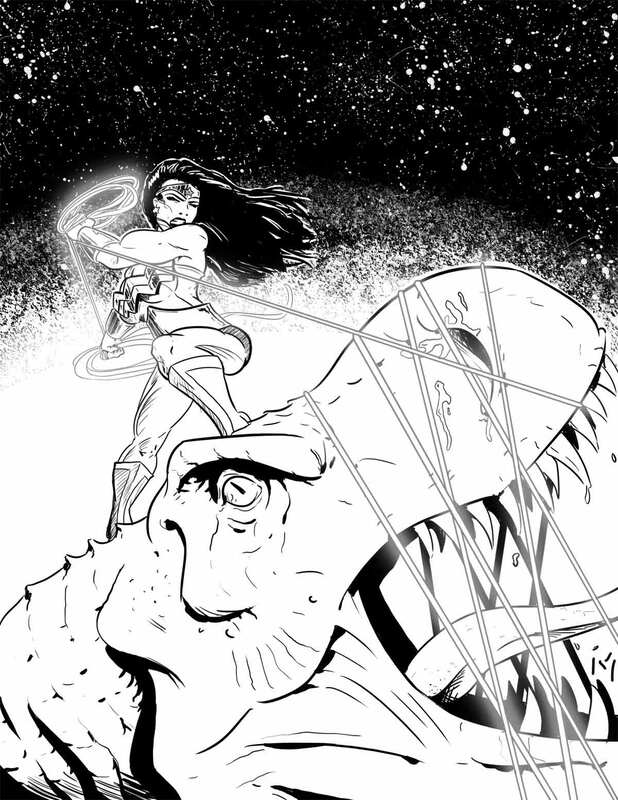 This is a drawing of Wonder Woman I did for my Niece. She is a big WW fan just like her mother. I wanted to have WW doing something that would look just as cool as anything Batman or Superman would do. Can’t go wrong with roping a T-Rex I guess. This was my first attempt at a T-Rex and with it just being the head I didn’t get to explore much. It is pretty close to a reference image I had. For a paying job I wouldn’t the drawing to be too similar to the reference. Seems dishonest. I let it slide here though.… KEEP READING! 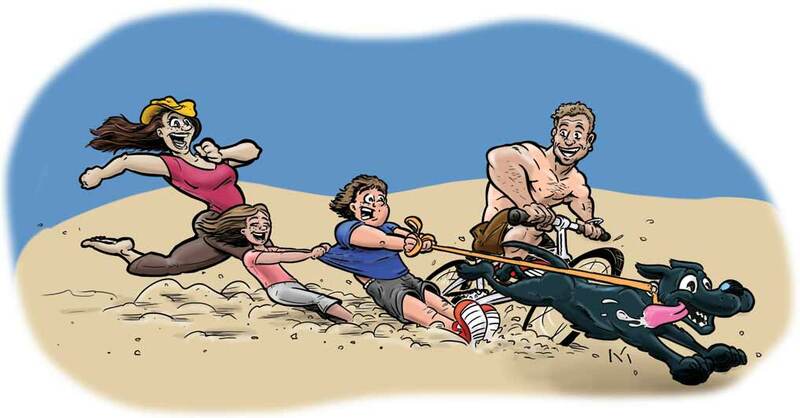 My sister and her family live in Saudi Arabia and for their Christmas present I decided to do a cartoon drawing of them. Here is a brief breakdown of my process. I started off with a very rough outline just like I do with every drawing. This rough is more for the purpose of blocking out the composition than actually working out details like facial features, etc.… KEEP READING! Just doing a quick little sketch tonight. I was in the monkey mood. 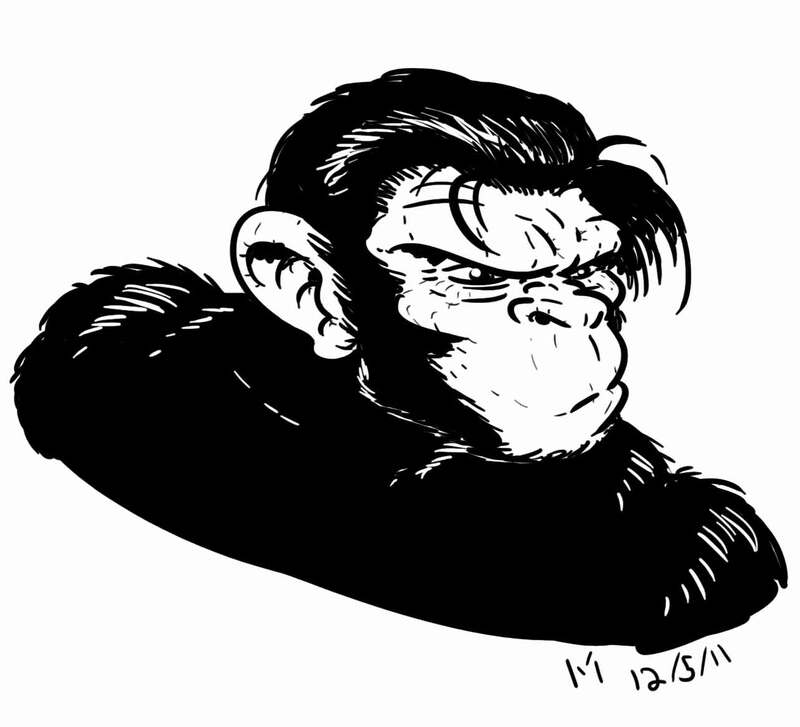 There is another ape themed project I am doing for a client, and I didn’t have it out of my system yet. I’ll be sharing that one here once it is locked. Head construction on these guys is an interesting change from the norm. Very close to a human, so it is easy to fall back into a people drawing groove. Drawing is about recognizing shapes, especially in unfamiliar objects. Sometime proximity can be dangerous and the subject will be recognizable in the wrong way. I think I did all right here.… KEEP READING! 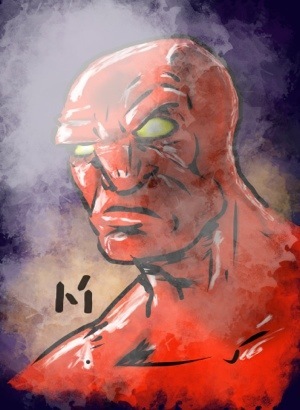 I am currently teaching myself to paint digitally in Photoshop. I’ve never painted, digitally or traditionally, and it is an interesting challenge. To train myself I’ve been watching a lot of tutorials on Youtube. I’ve also subscribed to the video lessons of Will Terry, a prominent Children’s Book Artist. With painting I need to think about how the light and the volume of my subjects interact. I have background in film and photography so the concepts of lighting area easy enough to understand, but translating that to hand drawn images is taking a bit of practice. I think that I am starting to get the hang of it though.… KEEP READING! I’m not the kind of guy who gets the latest tech the day, or the year, or even the decade that it is released, but I will definitely be pre ordering this! 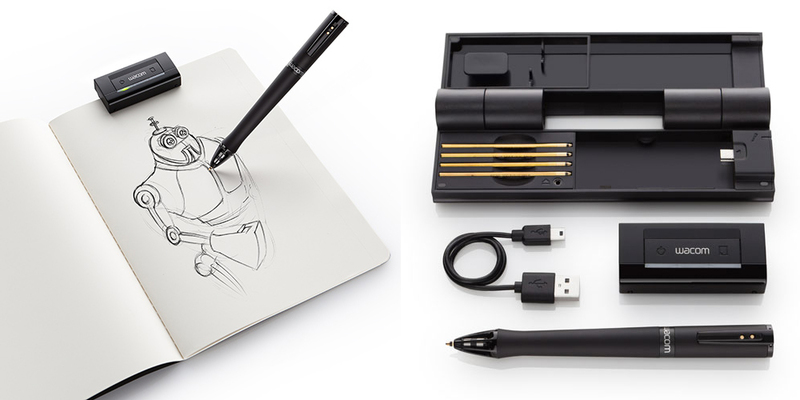 The upcoming Inkling from Wacom is an ingenious little thing that records what you are drawing on paper. The pen is a pen, but also a pressure sensative stylus, that transmits to a little receiver that clips onto the top of your paper. Your sketches can be saved as any number of files, including Photoshop and Vector Graphics! The pen and the receiver (i guess that is what it is called) hold a charge for about 8 hours and can be recharged via USB.… KEEP READING! The primary character in Henchmen, the comic book series I am working on, is Drake Drexler. A lot of comic book characters have alliterative names, so I thought mine would to. In the first draft of the story his name was Cage Drexler, but it didn’t sound right. A friend suggested Drake instead and it stuck. The gist of the character is that he is a young runaway, no more than twenty one. At one time he was the high school football star of his home town. Popular and confident until something terrible happened that scarred him for life, physically and mentally.… KEEP READING! I always have several personal projects that I am working on at any given moment. Right now one of them is Henchmen, comic book mini-series planned for ten issues. The original intention for this project was to make it a series of short films that would be available over the Internet. I abandoned this approach for a variety of reasons, largest of which was budget. I wrote the story to work with an intended budget of about $5,000 per episode. Even that amount, which is essentially nothing in the scheme of film budgets, was beyond me. Ultimately it was probably for the best.… KEEP READING! An odd by-product of my morning warm up. This is my first post on my new blog. The idea behind this blog is to give you an insight into how I create my illustrations, both for my personal and professional projects (when clients allow it). Even though I’ve been drawing my whole life there is always room for improvement. With every project I do I try to learn something new. 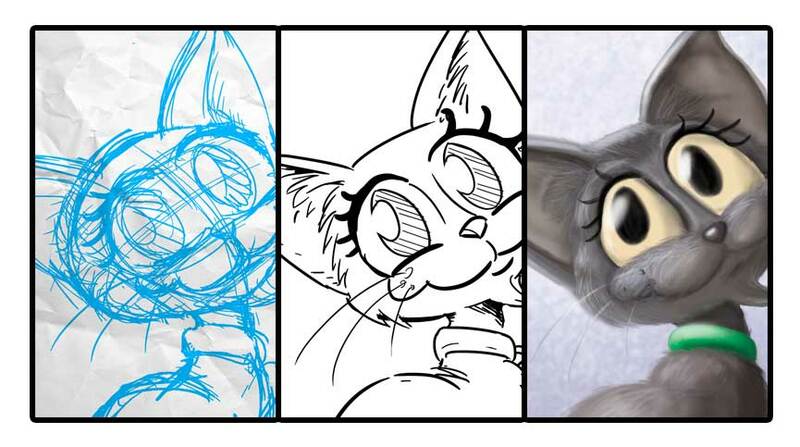 It could be something as simple as another way to draw a nose, or as complicated as adapting an entirely new style. For instance, I’m currently teaching myself how to paint digitally.